The Jazz Hybrid supermini borrows its petrol-electric drivetrain from its slightly larger sibling, the Honda Insight hybrid. The exchange is no robbery, given that the Insight was itself built atop the Jazz’s chassis. And the hybrid powertrain is in turn a simplified and downsized collection of pieces proven in the earlier Civic IMA hybrid. 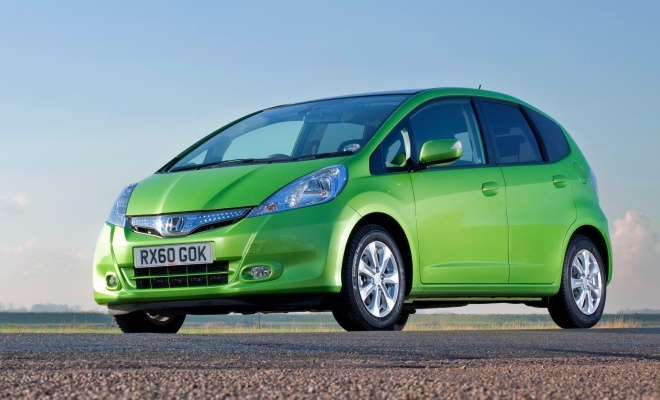 The result is the cheapest hybrid car on sale in the UK. It might also have resulted in an incoherent parts-bin lash-up as well, but Honda has avoided that pitfall. The hybridised Jazz feels like a reasonably seamless whole, and is certainly less obviously stitched together than Toyota’s Prius-powered Auris hybrid. 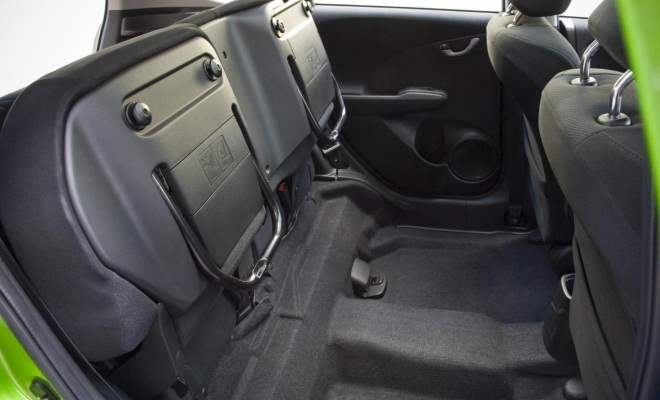 The Jazz’s party-piece flip-up rear seats remain, for those inclined to carry bicycles or tallboys at the weekend. The petrol tank stays under the front seats, while the new batteries have been squeezed under the boot floor, where they gobble up about 100 litres of storage capacity, leaving a bearable 300 litres for luggage. Under the bonnet lurks the Insight’s 1.3-litre, 87bhp petrol engine, supplemented by a 14bhp electric motor. The gearbox is a continuously variable pulley-and-belt system. 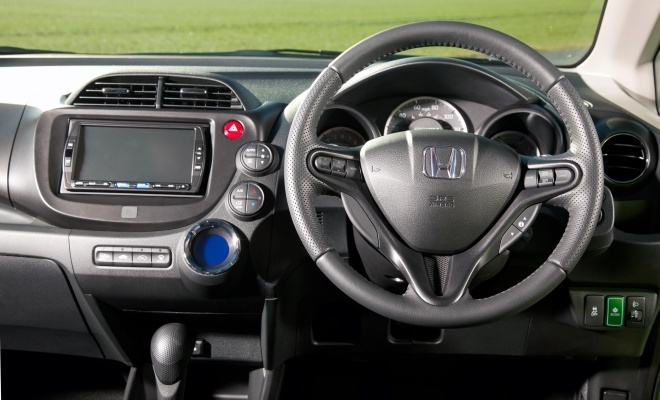 By nature this CVT box can slide seamlessly between its maximum and minimum ratios, but Honda has grafted on six electronically governed steps so that the driver can conduct affairs via column-mounted paddles. I suppose the downshift might be useful to set the car up immediately prior to an overtaking manoeuvre, but beyond that I struggle to see the point of the paddles. Even if you do select a certain ratio, the car seems disinclined to hang onto it for long and soon returns to its own devices. 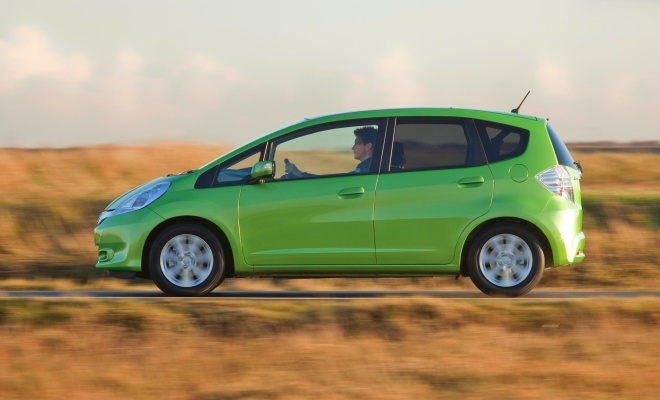 Flat out, the hybrid Jazz will hit 109mph, and when pressed will scoot to 62mph in 12.1 seconds. Which may not sound fast – and indeed is not fast – but is a full second quicker than a 1.4-litre petrol Jazz with the same automatic transmission. The hybrid and 1.4 can muster almost the same peak power, so the difference is all down to the torque advantage of the electric motor. The hybrid car’s sprint time is made all the more impressive when you note that it weighs 1209kg – 70kg more than the plain petrol version. There are two driving modes: normal and eco. The economy mode is active by default – the button to switch it off is a big green lozenge hiding down by your right knee. Hit that button and throttle response is noticeably sharpened, as is the actual acceleration that results. Whichever mode you choose, though, the Jazz hybrid doesn’t feel like a fast car. In my test, with three adults and their luggage aboard, accelerating to join a motorway had me denting the floorboards. Not that you’d buy a Jazz for outright pace. Space and frugality are more its thing. When not being impatiently whipped, the Jazz Hybrid achieves 62.8mpg and 104g/km on the combined cycle test, earning it a Band B rating for tax. Those figures are improved from about 125g/km and Band D for an ordinary automatic Jazz. It’s unfortunate that the numbers aren’t just a little better. That 104g/km rating means the greenest Jazz misses out on London Congestion Charge exemption and zero road tax, where the figure to beat is 100g/km. Neither of which will matter much if you live well beyond London, though, because a Band B tax disc costs only £20. The CO2 figure is low enough for the Jazz Hybrid to avoid showroom tax. On real roads, when driven without particular care, the hybrid’s miles per gallon score will loiter between the mid 40s and mid 50s, depending on load and driving style, according to the car’s own dashboard. Speaking of which, the Jazz’s instrument panel has been coerced into giving colour-coded eco-driving feedback, aping the more sophisticated Insight. 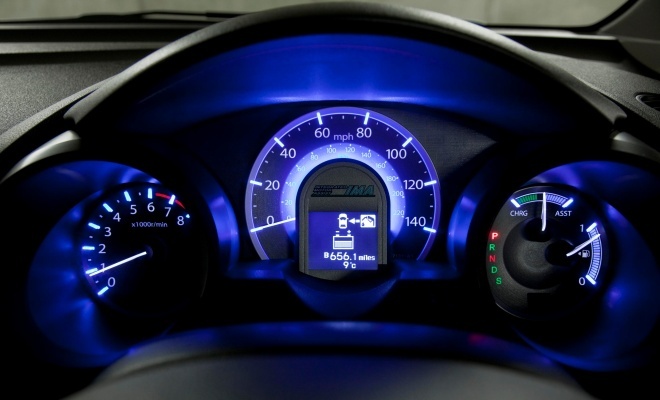 The instruments are ringed in little oblong blue lights, and those surrounding the speedometer will change colour in response to driving efficiency. Accelerate and brake gently and the lights glow a reassuring green, push more firmly on the pedals and they’ll shade to turquoise and then blue. There’s also a small demand meter, that swings left or right to indicate power shuffling in or out of the batteries, designed primarily as a guide to efficient regenerative braking. It’s not especially easy to read nor particularly instructive, so I mostly ignored it. A central digital display offers more useful supplementary information, including energy flows, average consumption, instant consumption and the state of charge of the battery. Overall, the interior feels nicely designed, well screwed together, and very spacious. The car is reasonably quiet, there’s a powerful aircon system, and all-round visibility is good. There’s even legroom for adults in the back. Those welcome basics aside, a Jazz is not a particular cosseting place to spend time. Most plastics are shiny and brittle, while the fabric upholstery on my test car wouldn’t have looked out of place on a pair of Marks & Spencer slippers. Youthful it ain’t. For leather seats you will need to spring for the top-spec HX package, which costs from £17,995. There are four trim levels on offer, starting at £15,995. The Insight, by contrast, is not much larger and runs from £16,675 to £20,645 across five trim steps. All things considered, the Jazz Hybrid feels a lot like what it is – a cross between a standard Jazz and its Insight big brother. It’s compact, spacious, versatile, very easy to drive and reasonably affordable. 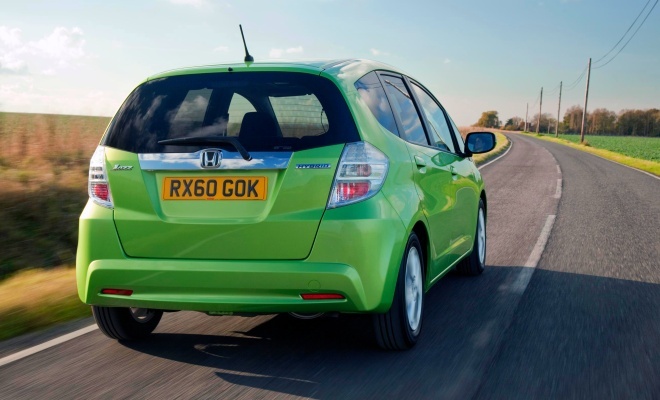 I found nothing much to dislike during my time spent with the little green Honda. But equally, I didn’t find much to love, either.